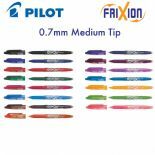 Pilot FriXion pens are highly effective erasable pens with amazing heat-sensitive ink. Heat generated by the friction of the built in eraser causes the ink to become clear! no mess, no bits of eraser and completely 'erased' lines which you can then re-write using the same pen.